I believe that an outfit without jewellery (or at least a watch) isn't complete. 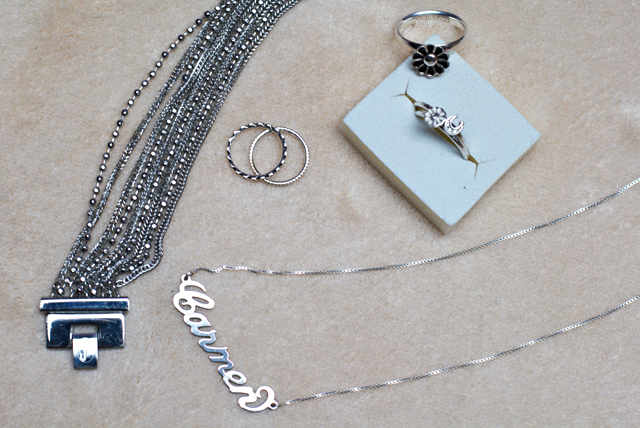 But then again I also believe in the power of delicate jewellery. I've been wearing every single of the shown pieces in outfit posts before but I think they all deserve a closer look as I've been counting them among my favourites for quite a while. I've loved golden jewellery when I was a teenager and whenever I had the choice between gold and silver (talking of colour, not material) I went for gold. Over the last few years however, I started wearing lots of black, grey and blue, which I think look way better with silver jewellery. 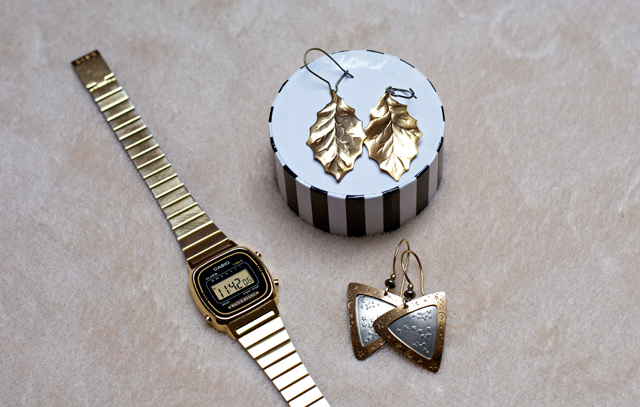 Still I have a few golden favourites left, namely the versatile Casio watch and two pairs of second hand earrings. A few years ago I also developed a huge crush for rose gold. It just looks so elegant and I think it can perfectly be combined with both gold and silver jewellery. 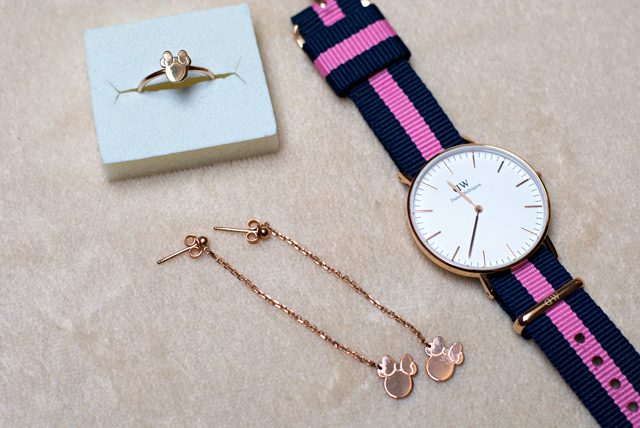 That's why I chose this cute Minnie Mouse ring in rose gold a few years ago and my sister got me the matching earrings from Twice as Nice for my last birthday. The Daniel Wellington, which was added to my collection recently, also perfectly shows how good rose gold looks in combination with classic colours. When it comes to buying new jewellery however, I now mainly stick to Sterling Silver as it isn't expensive and yet the quality is pretty good. That's how I even bought six silver rings from Spinning Jewelry before they closed their shops. As you can see I'm really into small rings and finger knuckle rings as everything big would annoy me too much. Lately I've also been wearing the Jenny Lane bracelet a lot as it's delicate and yet makes a statement at the same time. Currently I'm looking for new shops to buy good quality jewellery so I suggestion is welcome. So far I love browsing Twice as Nice whenever I come across one of their shops, or Lajoia which is an online store I've been mentioning quite a few times as well. I love these Minnie ring and earrings !